Do you find it hard deciding whether you should install nice new bath taps or a new shower? We understand your struggle as nothing beats a nice long, relaxing soak in the bath, but then again, sometimes all you want is a shower that will wake you up and leave you feeling refreshed for the day. You can now have the best of both worlds with the Architeckt Misa Bath Shower Mixer. A bath shower mixer is a perfect way to spruce up your bathroom, to create a relaxing haven, which you’ll be able to enjoy for many years to come! Featuring high tech engineering this bath shower is designed to withstand the test of the time to give you a super high-quality product. To further lengthen the life of this bath shower mixer a solid brass construction of the body is included for a durable build. This is then coated in multiple layers of dazzling chrome for a striking bright finish. The silky smooth surface of the tap also prevents rusting – meaning it will look brand new for a whole lot longer. The Misa Shower Bath Mixer features excellent engineered internals including robust ceramic disc cartridges. They function effortlessly to ensure the tap won't leak or drip and to give you the smoothest operation as possible. Unlike rubber washers that you would find in older taps, the discs won't wear away, so your bathroom won’t have any annoying drips. For that added peace of mind, we have included a brilliant 5 year manufacturer guarantee. 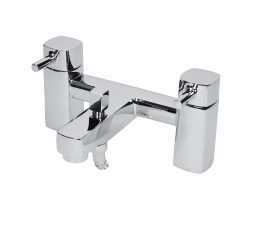 A chrome-plated finish that protects the brass from rusting. Quarter turn ceramic disc technology is included as standard. Can be used with all types of plumbing systems. I have not had these taps fitted yet, But they are good quality taps, at a very reasonable price I am looking forward to seeing them fitted.